Since two readers kindly mentioned a previous post about a Victorian dress on social media, I have many new followers. Thank you! and, welcome! I’ll try to wander into the 1800’s more frequently! 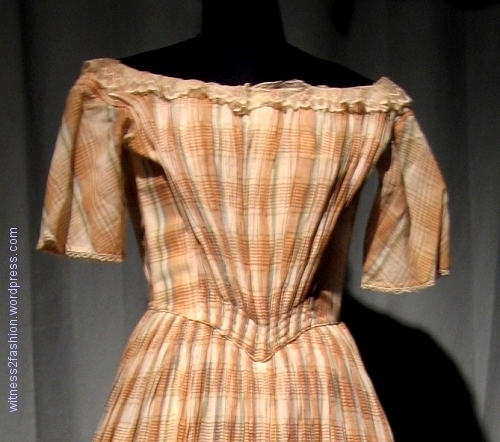 A fan-fronted dress in sheer plaid with bias flounces. From a private collection. I apologize for the picture quality. I was documenting many dresses, which belonged to a friend, for the purpose of an inventory, with no thought of ever blogging about them. (The collection has been sold.) I didn’t have the luxury of researching on the spot, finding the perfect undergarments, or worrying about perfect pictures. H0wever, just being able to handle 19th century garments, and look inside them, is a privilege, so I feel obliged to share. Bodice of a fan fronted dress, early Victorian. Private collection. 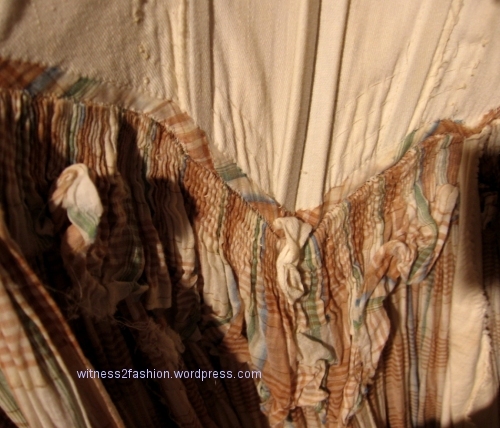 The bottom of the “fan” of fabric is gathered with rows of stitches about 1/2 inch apart, which creates a slight “pouch” effect and makes the gathering very flat over the waist. CF waist, fan fronted dress. The bodice is finished with a very typical period detail: narrow cording encased in bias self-fabric. You can also see that the cartridge pleating has several rows of stitching, which makes for a less bulky and more controlled waist area. 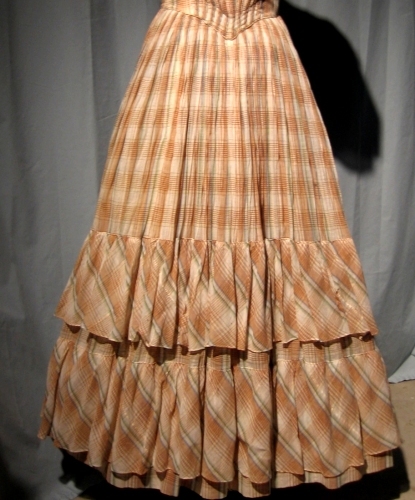 Early Victorian fan-fronted dress; inside view of center front waist where it attaches to the skirt. 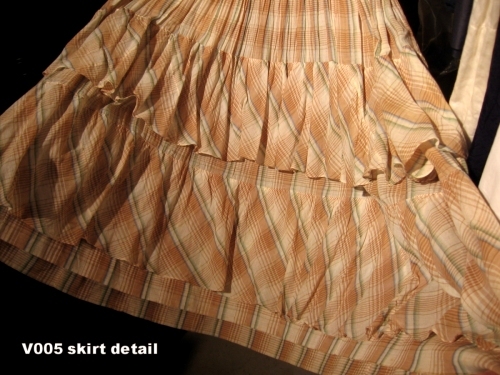 Characteristic of period construction, the skirt was gathered straight across the top of the yardage. Instead of cutting away the fabric into a V shape to follow the bodice, the Victorians left the excess skirt fabric hanging inside the front. Also visible in this photo are a few faint stitches ruching the tightly gathered front “fan” to the underbodice. You can see the way the bias fabric of the piping which follows the waistline has been hand-stitched to the underbodice. There appears to be a white hanging loop at the point of the bodice. This may have been added by a collector. 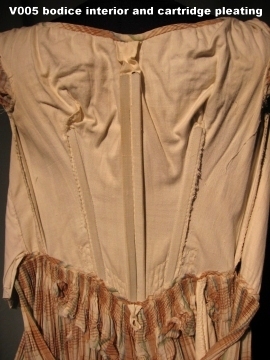 Underbodice of fan-fronted dress. Inside front, showing boning. When you consider how the skirt was constructed and attached to the bodice, the straightness of the horizontal stripes in the fabric becomes truly impressive. Look at how well the stripes line up. (At this time, skirts were not cut into gores; all the side seams were on straight grain, turning the skirt into a very wide tube.) Read more here. The flounces on the skirt are cut on the bias and not really gathered; the sheer material of the dress seems to change its pattern when closely gathered. I actually wondered if two different fabrics were used, but the contrast is entirely due to the the way the material looks when closely gathered or not gathered at all. The flounces and hem of the fan-fronted dress. Look at that pattern match! At the top of the lower flounce, we can see that its gray and white stripes line up perfectly with the vertical stripes on the skirt, with the bias flounce eased only enough to make it work. I don’t know the fiber content; I am guessing that its nearest equivalent would be printed cotton voile. The dress works so well because the fabric is so soft and light that it can be gathered very closely. Back of fan-fronted dress. 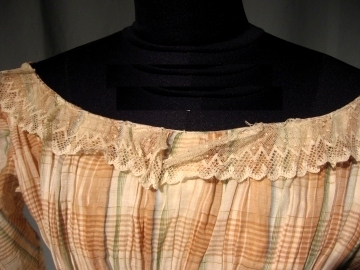 Bias sleeves were common in the 1840’s and 1850’s. I only photographed the back while it was on a padded hanger; it has a hook and eye closing. 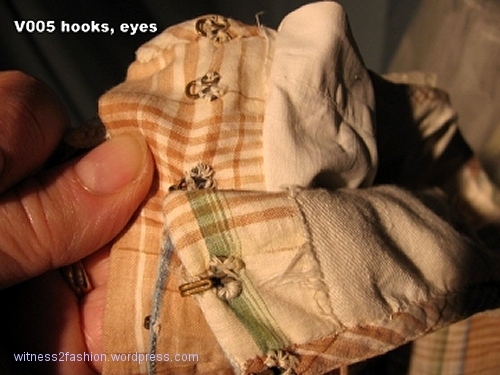 Hooks and eyes at center back of fan-fronted dress. 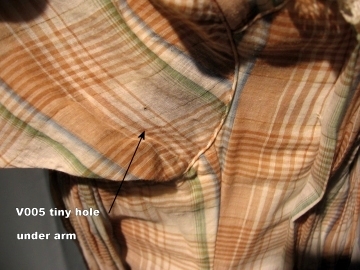 I documented a tiny hole in the fabric, and therefore have this picture which shows the piping around the armholes; there is no piping at the side seam. Armhole piping, left side of dress. Neckline of fan-fronted bodice is trimmed with lace. The lace didn’t survive as well as the dress. I know very little about lace. Is this machine-made? It may well be. Did the original owner wear sheer engageants — interchangeable sleeves — with this dress? I don’t know. The sleeves themselves are not tight, but roomy. My hat’s off to the dressmaker, who cleverly used the stripes in the fabric as guidelines for all her hand gathering stitches! Dating? 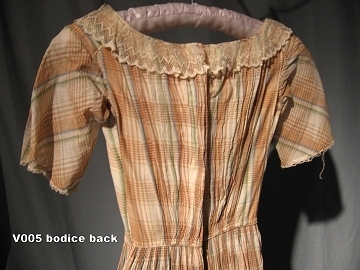 A Fan-front bodice pattern from Past Patterns is based on a dress from the 1840’s. Click here to see Past Patterns No. 801. 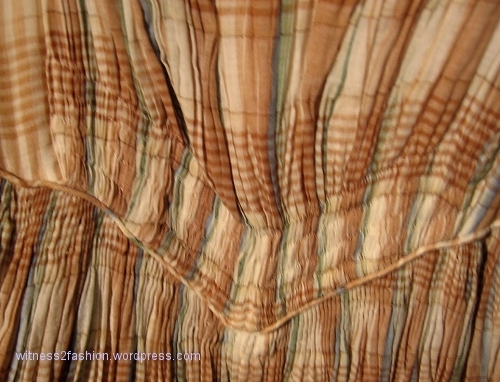 I once owned a completely hand-stitched fan-fronted bodice in apple-green striped silk; it had pagoda sleeves. As the Past Patterns site points out, photos from the 1850’s also show women wearing similar dresses. I do hope someone who really knows Early Victorian styles can help to put a date on this dress, although there was a considerable time lag between city and country styles, so real precision is impossible without provenance. Who knows, someone may find a photo of it being worn! 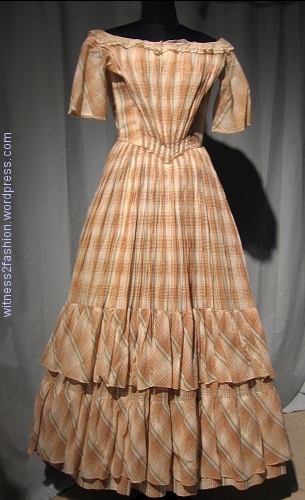 Edited: This link added Aug. 9, 2015: another light weight cotton dress, dated 1860, with bias-cut ruffles, was pictured and described by Alys Mak-Pilsworth at the Ryerson Fashion Research Collection. Click here. What gorgeous workmanship (or maybe we should say workwomanship.) That a nice trick with the waist line fabric. I think I may be responsible for the increase in traffic, so I thought I should say hello and express my enormous appreciation and gratitude for the amazing wealth of knowledge and source material you are sharing here. I spend an awful lot of time doing nothing at reception desks in the summer, while the entire company is away on vacation, so I have a lot of time to waste waiting for the mail or perhaps a rare visitor to arrive. I think I spent almost the entire last week happily reading this blog. I really appreciate the fact that you write long, well researched and analytical text that doesn’t just skim the surface. It is hard to find this kind of writing and this depth of knowledge, and I’m one of those readers who don’t think it ever gets too long or too technical, really. That’s the beauty of the blog format, in many ways; it doesn’t have the space limits that books necessarily have, you don’t have to edit out a ton of interesting stuff because paper, printing and binding is expensive. So thank you. You are doing fantastic work here. Thank you for reading and sharing. The friend who collected some of the garments I’ve written about was computer-phobic, so she never knew how many kindred spirits shared her interest. I’m amazed by the variety of online fashion history blogs. I am so glad you saved all the photos from the inventory, because now we get to enjoy them. And it is amazing how turning that fabric on the bias gave it a totally different look. Oh such a beautiful dress! The details like the stripe matching are amazing! And I learned a new trick (thank you!) – when I don’t have hooks & bars but only hooks & loops, I can set the loops backwards! I can see that creating a small fold of fabric over the loop ends when the back is closed up – interesting! I didn’t spot that. I have heard of alternating hooks and loops so you can’t accidentally unhook the whole opening, but I’m not really a loop fan! Bars can be hard on fragile fabrics, though. Aren’t we lucky to live in a time with lots of “closing” choices! Memory lane: I don’t think I ever bought a dress in the 1960’s that did not have a hook and eye or thread bar at the top of the zipper. I guess zippers are more reliable today. Many of the more expensive dresses still put hooks and eyes above the zippers. (And I still do on those I make.) I’m sure it’s all about cutting costs by eliminating tiny things like hooks now because I don’t think zippers are that much better.